IBM Towers/Wells Fargo Center – First Corporate “1031 Swap” in the Nation. Our strongest talent is assisting clients on how to avoid or reduce costs and increase return on assets or investment. We examine your objectives relative to interest cost, carry cost, obsolesce and opportunity cost, redundant and hidden cost, any cost that could at some point be changed to create revenue. We are currently examining and introducing to our client’s ways to convert energy cost into new revenue streams. We back our recommendations with strong analytic research to insure that our position is objective and not subjective. We have developed proprietary techniques on Off-Balance Sheet, Synthetic Structures to optimize financing opportunities. 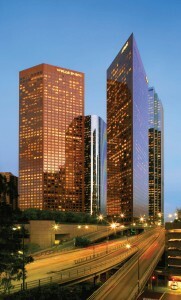 The Wells Fargo Center in downtown Los Angeles featured on this page was the first “1031 Corporate Exchange Swaps” conducted in the country, and published in the Journal of Corporate Finance and was created by Rodney D. Jones Sr. NCR’s founder. Our Structures and Advice have helped save millions and created new revenue for both For Profit and Non for Profit and Municipal and Quasi-Governmental Organizations.